Categories: Fire, Materials & Texture, Weapons, Whooshes. How do you make a tube growl? Methylacetylene-propadiene propane, of course :D This incredibly combustible gas burns through tubes short and long. Sometimes the flame viciously tears it’s way to the exit with a large pop. Sometimes it gingerly resonates along the length of the tube until it fizzles out. These unique sounds are great design tools for weapons, impacts, transitions, and so much more. Fret not, Sound Designer, the ultrasonic content in these collections is captured to allow you to massively pitch-shift and process the sounds while retaining fidelity and revealing elements you couldn’t perceive before. 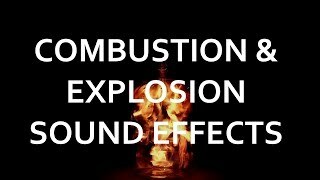 Check out some of Combustion’s design potential (created only with pitch shifting and reversing).